Universal Studio's superior adaptation of H.G. Wells' The Invisible Man is rich in timeless special effects, amusing dialogue and witty dark humor. Director James Whale brilliantly conducts these elements, along with Claude Rains' strong theatrics, giving this film uncanny charm. It begins with one of its best scenes: The Invisible Man - Jack Griffin (Rains), after trudging through the snowy night, swings open the door of a small English inn. A whistling gust of wind follows him...and the patrons, forgetting their merriment, watch in awe. His bandaged face, false nose, and dark goggles ominously stare back (a beautiful upward close-up punctuates the tension). He demands - and gets - a room, then instructs the innkeeper's quirky wife (Una O'Connor) to have NO ONE disturb him (much like asking Bozo not to be a clown). Griffin takes his room...and the following morning, sets up a makeshift lab. While desperately trying to reverse his invisibility, he is disturbed by the innkeeper's wife and becomes violent...eventually sending her husband tumbling down the stairs. Once the local constable is brought in to arrest him, off come the bandages and clothes. 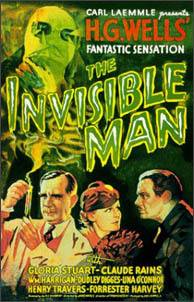 The Invisible Man is revealed - convincingly - with maniacal laughter and chaos. Pondering Griffin's whereabouts is the party consisting of his girlfriend Flora (Gloria Stuart), her father Dr. Cranley (Henry Travers) and "friend" Dr. Kemp (William Harrigan). They discover notes of his experiments with the drug "monocaine" and fear that he had made a dangerous discovery. Griffin used monocaine, mixed with other substances, to gain invisibility. The concoction also increased his physical strength and aggression. On a quest to "rule the world", Griffin visits Dr. Kemp...offering him a partnership. A frightened Kemp reluctantly plays along, but soon blows the whistle. With police surrounding the house, The Invisible Man exits through a window, promising Kemp: "At 10:00 tomorrow, I shall kill you." In slapstick fashion, he terrorizes the police and town folk...then it soon escalates into a murderous binge, as The Invisible Man has promises to keep and a world to rule. Just as entertaining as any of the impressive visual effects - such as screaming women being chased by a pair of trousers...or a cash drawer carrying itself out of a bank - are the interactions of the supporting characters. Their dealings with the surreal situations are not only humorous - but quite believable.